Shechita around the world has been under the gun (the stunning gun) for the last few years, with the latest attacks taking place in the European Parliament. And, at the same time in the Netherlands. In the Netherlands the country is threatening to stop shechita altogether. In the EU, however, the attack is more subtle. The enemies of kosher slaughter (and of halal), such as the secular and humanist groups (as well as the animal rights groups), are claiming the “rights” of all consumers to know if meat has not been stunned — something that these groups are claiming is akin to humane slaughter. The latest blow came on May 10, 2011, when the members of the European Parliament (MEPs) who sit on the Environment, Public Health and Food Safety Committee decided that food labels should contain much more information about stunning. Furthermore, meat labels will need to indicate where the animal was born, reared and slaughtered. In addition, meat from slaughter without stunning (in accordance with kosher and halal requirements), will need to be labeled as such. This is akin to a “yellow star” for meat to indicate it as “kosher.” The pressure will then be on the populace to avoid such meat as they consider it inhumane in its processing. Non-kosher meat establishments will then refuse to buy the hindquarters and the neveilos and treifos from kosher slaughter. If those who slaughter kosher meat are unable to find a market for the majority of the kosher meat slaughtered — the hindquarters and the neveilos and treifos — they will refuse to be involved in kosher slaughter. At that point, the only viable way to get kosher meat will be production in countries outside the EU or in dedicated kosher-only factories where over 50% of the meat will go to waste. 1. The impetus for most of this attack on kosher has been by animal rights groups and vegetarians. They are very popular in Europe, but they are also growing very rapidly here in the U.S.
2. PETA has reared its ugly head here in the U.S., nearly single-handedly bringing down the largest kosher slaughter in the U.S. : Rubashkin’s Agriprocessors. In addition, PETA is challenging the Jewish practice of kapparos wherever it is being practiced. 3. I served for several years on a committee of 15 to oppose attempts by U.S. restaurants to ban the use of (non-kosher parts of) kosher-slaughtered meat for their supposedly humane reasons. It is only time when the pressure will be put on non-kosher establishments and processors to label their meat as slaughtered without stunning — i.e. kosher-slaughtered. 4. After over 100 years, the kosher laws have been deemed unconstitutional. The status quo is no proof of future governmental protection. What is law today may be banned tomorrow. This is also why New York State disbanded their Bureau of Kosher Law Enforcement. Hemp is a plant that belongs to the Cannabis family. Hemp food ingredients are produced from whole hemp seed by mechanical processing. No chemicals or additives are involved in the production process. Hemp food ingredients are naturally free of gluten and the known top 8 allergens: dairy, egg, wheat, soy, peanuts, tree nuts, fish and shellfish. Hemp Oil Canada produces Hemp Seed Oil, Hulled Hemp Seed, Toasted Hemp Seed (with or without kosher sea salt), Hemp Flour, Hemp Protein Powder, Coarse Hemp Powder, and Hemp Coffee (a mixture of coffee and hemp, a great way to get the benefits). All are certified “OU-Pareve”. They will soon have a kosher-certified Hemp Oil Veggie Green Caps which are hemp seed oil in starch-based capsules. Hemp seed contains 80% polyunsaturated fats or the “good fats” and zero trans fat. Hemp seed contains the balanced 3:1 Omega-6 – Omega-3 ratio and naturally occurring Gamma-Linolenic Acid (GLA) and Stearidonic Acid (SDA) which our body needs for a proper defense system against illness. Total carbohydrates in hemp seed are mostly from insoluble dietary fiber which aid digestion. Since carbohydrates in hemp seed are mostly from fiber and not starch or sugars, you can get your nutient requirement without gaining extra calories. Protein in hemp seed is easily digestible compared to other protein-rich sources such as soy. Other vitamins and minerals found in hemp foods are calcium, phosphorus and magnesium which are important for bone and teeth formation. Potassium which is needed to make our body’s protein is also present. Hemp food is an excellent source of B Vitamins such as thiamine, riboflavin, niacin, Vitamin B6 and folate. Thiamine, riboflavin and niacin are important to produce energy. Folate helps make new cells. With the exception of coarse hemp powder, all products contain Vitamin E. The essential iron-copper-zinc trio are present in small balanced amounts. Iron, copper and zinc are important to make red blood cells and carry oxygen in the blood and to our muscles. Hemp Seed Oil is a delicate culinary oil with a light flavorful nutty taste. It can be used as salad dressing or cooking oil provided that the temperature does not exceed 350°F (178°C), otherwise the nutritional benefits will be reduced. Toasted Hemp Seed and Hulled Hemp seed are great garnishes. If you want that extra crunch in your salad, add toasted hemp seed. If you want something chewy, go for hulled hemp seed. Whichever you choose, you will get more protein, insoluble dietary fiber, iron, Omega-3 and B Vitamins than other seeds/nuts commonly used to top salads. Toasted hemp seed and hulled hemp seed can also be eaten “as is” as a snack. Toasted hemp seed comes with sea salt or unsalted. A great nosh, it is filled with energy. Hemp Coffee is a premium blend of Canadian roasted hemp seed combined with organic Fair Trade roasted coffee beans producing a unique, nutty flavored, full-bodied coffee. It gives you the caffeine that other coffees do and all the nutritional goodness that hemp food products have to offer. Hemp Protein Powder (50%, 43%, or 33%) can be used in beverages. It is an alternative to anabolic steroids for increasing muscle mass in athletes, body builders and people who just like to stay in shape. There are no hormone mimickers, just arginine, lysine, and glutamine, which stimulate the body’s release of hormones that promote muscle formation. You can drink it with water or in a smoothie. Hemp Protein Powder and Coarse Hemp Powder can be mixed with your gluten-free flour blend to make some great bread. Alternatively, you can mix in a cup of Toasted Hemp Seeds or Hulled Hemp Seeds as substitute for other nuts. For further information about hemp products or to purchase products you can order online at www.hempoilcan.com. Call Sales and Customer Service at 1-800-Buy-Hemp (289-4367) or email info@hempoilcan.com. Hemp Oil Canada, Inc. (HOCI) is Canada’s leader in production and distribution of hemp food products. By law, hemp cannot be grown in the US and so the majority of hemp food products available in this country are produced in Canada. Hemp Oil Canada maintains a Certified Organic, Kosher (“OU”), Fair Deal, Halal, and Non-GMO verified facility compliant with HACCP Regulatory requirements. Hemp Oil Canada is the largest bulk wholesale producer and private label packager. They ship worldwide to individuals and businesses of all sizes. Many kosher hemp products are produced under private label at their facility. Want to start a business selling hemp products or to order product with your brand name? Hemp Oil Canada maintains a private label packaging service which includes using their packaging with your logo or custom designed packaging as well as assistance in regulatory compliance. Hemp Oil Canada also provides custom-blends. Hemp Oil Canada is committed to provide you the “Perfectly Balanced Goodness” of hemp. Hemp Oil Canada provides you the seed you need! Order online at www.hempoilcan.com. Or call Sales and Customer Service at 1-800-Buy-Hemp (289-4367) or email info@hempoilcan.com. To date, the program has become a multi-level training and education program for various groups ranging from elementary through high school class groups for boys, as well as special programs for young men in mesivta high schools and in beis medrash. Intense training programs are being provided for kollelim, vaadei kashrus, rabbonim and mashgichim. We are even taking reservations from camps. The number of participants who have attended our programs is growing rapidly. We are receiving continuous feedback and a multitude of correspondence from the past participants, in mail and in email. Over the time, many of the past participants have developed a strong relationship with Pos’tiv, and continue to consult with Pos’tiv for support and guidance, whether professionally as mashgichim or as individual kosher consumers. Some meet regularly with Pos’tiv staff to sharpen their skills. I have been thinking a great deal about what it is in particular that makes this program so desirable and so rewarding that many participants have sent their friends, relatives and coworkers to spend a day at Pos’tiv. I have been trying to understand what makes Pos’tiv unique. What inspired Pos’tiv ownership to make such a serious investment of time, money and manpower? How did Pos’tiv begin and how was it set up? How is it that Pos’tiv and its kashrus lab have become such a resource for teaching the community at large? To answer these and other questions I turned to the people at Pos’tiv for the answers. These are the results of my search. When pre-washed salads became popular, for a while, it was believed by the kosher consumer and the kashrus industry that pre-washed salads seemed to be a perfect and convenient solution to render produce insect-free. However, after careful scrutiny, it was discovered that many vegetables, including romaine lettuce, spinach, and even iceberg lettuce, could not be rendered free of insects, even by the best washing systems. I was shocked to learn from serious kashrus agencies that sometimes they are unable to put out even iceberg lettuce and coleslaw, due to the high level of infestation. And, that is with only a small amount of the produce being checked (often one bag in 1,000 or even a smaller sampling). The response of many was to carefully check all suspect vegetables before eating them. Unfortunately, the overwhelming majority of consumers do not have the know-how to inspect produce for insects. They do not know what to look for, how to look, nor do they have the time and patience to do so properly. Indeed, the engineers that have designed the latest washing systems for the largest produce companies in the United States have asserted that no washing system alone could be expected to rid infested produce of insects. Certain insects, such as aphids and leaf miners, are beyond the range of even the most vigorous washing machine systems and cannot be removed from the leaf. Aphids cannot be removed because they attach themselves to leaves with a special sticky secretion that water can not release, and they have a needle type organ that fastens them to the leaf that also cannot be released by water. Leaf miners cannot be removed because they burrow tiny tunnels within the tissue of the leaf, and they live below the surface of the leaf. They too are not removable with water. A good washing system is only one of the many steps in a long chain of events necessary for the production of truly bug free kosher produce. A greenhouse, too, is not a magical solution. Greenhouse-grown produce can sometimes be more infested than non greenhouse-grown. Greenhouse-grown does not automatically mean that a head of lettuce is clean or kosher. A non properly constructed greenhouse, and a lack of a proper and continuous monitoring system throughout the growing process, are both a guarantee for insect infested produce. Pos’tiv Produce represents an exciting new approach in kosher produce, providing the discriminating kosher consumer with a full line of insect-free, ready-to-eat fresh produce. By using a combination of state-of the-art growing techniques, customized greenhouses and farming technology, while at the same time incorporating special kashrus controls as well as meticulous rabbinical supervision, they offer a guaranteed kosher bug-free product. In the planning stages, one remarkable decision was made. Pos’tiv would not be comfortable selling produce that would require any type of washing by the consumer in order to render the product insect-free. Pos’tiv was also not comfortable with any kind of minimal insect tolerance level. Rather, they sought methods to provide a product with a zero tolerance level for insects. That means that when they do a check (bedika) of the product at the end of the wash cycle there cannot be found even a single insect. Another Pos’tiv goal has been to put substance behind the term kosher in the produce industry. The company is built on a concept that, when it comes to kashrus, “good enough, is just not good enough”. The way that they like to describe it at Pos’tiv, is that they are a company that was created “using kashrus as the blueprint”, and not by trying to fit kashrus into the company, but rather to fit the company into kashrus. When it came to kosher certification, supervision and guidance, Pos’tiv hired the world’s most experienced and knowledgeable world-renowned expert in the field of insect infestation, Rav Moshe Vaye, shlita of Jerusalem. He is the author of a three volume work on insect infestation: Bedikas Hamazone Kahalocho. He has made this his life’s work, teaching many thousands through slide and digital presentations explaining how to examine all types of foods for insect infestation. The entire Pos’tiv process – from planting through processing – is under the strict supervision and guidance of Rabbi Moshe Vaye, shlita, together with the Orthodox Union, Rabbi Shia Katz, shlita and Rabbi Usher Eckstein, shlita. In addition, Pos’tiv, with the assistance of Rabbi Moshe Vaye, shlita, is studying many types of insect infestation, not only in salads, but in all types of foods. They have an ongoing relationship with several university entomology research labs. Some kashrus agencies have begun to use Pos’tiv’s services in research into infestation of a wide range of products, not only produce. Pos’tiv employs its own dream team of top consultants and specialists consisting of agronomists, entomologists, science specialists, farming specialists, growers, irrigation specialists, greenhouse engineers and architects, seed development specialists, chemical specialists, chemists, and nursery specialists. As owners and growers, Pos’tiv seeks the best resources for everything from the seedling development through the processing. Pos’tiv Produce was created as the ideal solution for discriminating consumers who care about kashrus. They purchased vast tracts of land, and have constructed state-of-the-art, custom-designed greenhouses, using specialized custom mesh. The mesh is treated with a specially formulated natural substance that repels insects. Likewise, the ground is periodically treated to ensure a virtually bug-free environment. There is constant inspection of produce both in the fields and before and after processing at their modern plant in Allentown, PA.
Pos’tiv employs a full-time team of workers that specialize in the greenhouse field. The greenhouse team continuously builds, repairs and maintains all of the different types of the Pos’tiv greenhouses. Each type of produce and seed variety requires its own unique atmosphere to grow properly, while simultaneously producing an insect-free product. Pos’tiv has engineered multiple custom greenhouse combination designs to help them develop and maintain a greenhouse atmosphere capable of producing all different types and seed varieties of insect-free produce throughout all the changing seasons of the year. In addition to the many custom greenhouse designs, the Pos’tiv customized greenhouses along with their greenhouse team have the ability to change and switch, at any time, the different types of mesh screening and different types of plastic covers that are necessary to change in order to conform with the need of each type of seed, season and weather. The advanced state-of-the-art washing and filtration systems at the Pos’tiv processing facility incorporate the latest in technological research, and employ cutting edge technology to further ensure the highest level of kashrus and food safety. As an added level of protection, the processing plant employs a unique patented customized washing system designed specifically for the removal of even the tiniest of insects. The equipment features specialized filters and is equipped with a mechanism that rotates the produce, so that all sides are exposed to the powerful jets of water. Expert mashgichim meticulously check the product through every necessary stage of the growth process and before and after the washing process. Every single bin is checked. A full variety of fresh produce, prepared by Pos’tiv under the most demanding of conditions, is now available to the kosher consumer at a reasonable price. If you believe I have resorted here to hyperbole, I invite you to examine for yourself. Reserve now for one of our upcoming training courses at Pos’tiv. 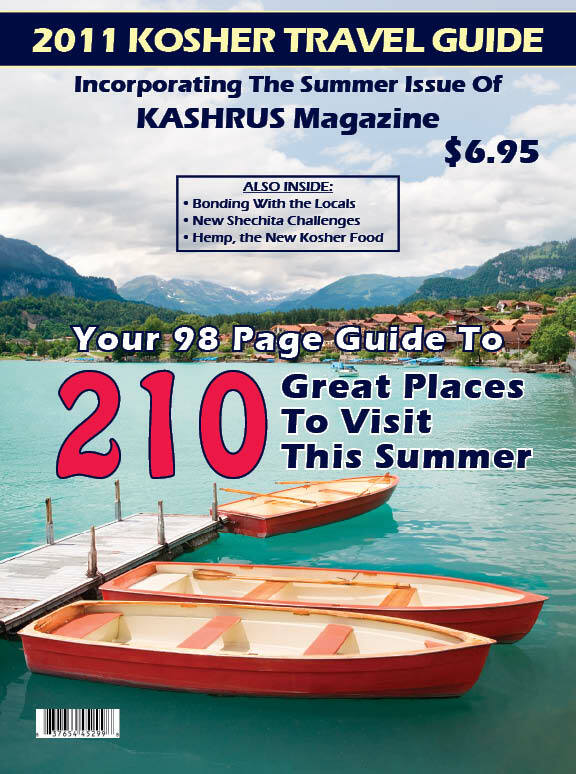 Call KASHRUS Magazine at 718-336-8544. The next three dates for our trips will be June 29, July 6, and August 17. I guarantee that it will be a day well spent.